This summer, the Deschutes River Alliance filed a lawsuit against Portland General Electric, seeking to enforce conditions of the Clean Water Act § 401 water quality certification for the Pelton-Round Butte Hydroelectric Complex. These conditions, formulated by the state agency in charge of regulating water quality—here, the Oregon Department of Environmental Quality (ODEQ))—play a critical role in ensuring that hydroelectric projects comply with state water quality standards. Compelling PGE to adhere to these standards is critical to our efforts to restore the water quality and ecology of the lower Deschutes River. PGE recently filed a motion to dismiss the DRA’s lawsuit. In its motion, PGE argued that citizens (including groups like the DRA) have no authority to enforce the water quality conditions found in a § 401 water quality certification. We strongly disagree with PGE’s position, and on Monday, October 17 we filed our response to PGE’s motion to dismiss. The clear language of the CWA, along with previous court decisions and other authority, establish that Congress authorized citizens to enforce these important water quality requirements. It’s important to note that PGE’s argument did not end with its misguided claim that citizens lack enforcement authority in these situations. In addition, PGE argues that the states that write these water quality-related requirements also have no enforcement authority. This surely comes as a surprise to the many states, including Oregon, that regularly enforce the Clean Water Act. In PGE’s telling, once a dam has obtained a Federal Energy Regulatory Commission (FERC) license, only FERC has the authority to enforce § 401 water quality requirements. This in spite of the fact that FERC does not write the requirements, does not formulate the state standards those requirements are based on, has no expertise about water quality, and is not authorized to implement the Clean Water Act. And we have been unable to find even one example of FERC actually taking an enforcement action for violations of § 401 water quality requirements. No doubt exclusive FERC enforcement authority would be convenient for PGE and other hydroelectric operators across the country, but such a result would undermine citizen and agency authority to protect and preserve water quality. It also would leave hydroelectric operators with virtually no effective water quality-related oversight. But PGE’s argument finds no support in the Clean Water Act. 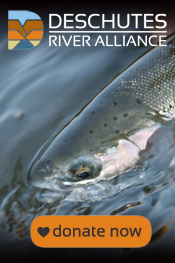 We intend to fight aggressively here, on behalf of the lower Deschutes and rivers across the country.